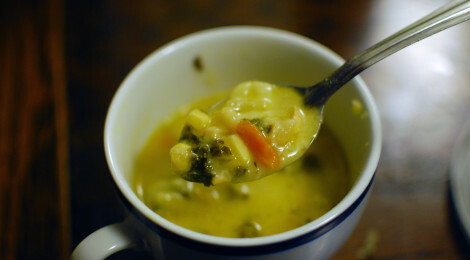 In the winter, soups are a staple. The homemade bone-broths are filled with nutrients for your body to build it’s immunity during the colder months. 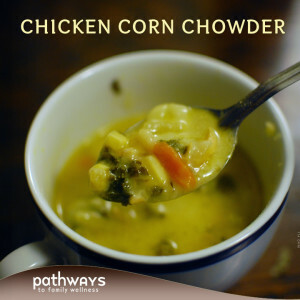 Often we make chicken soup or beef stew, but on occasion we are treated with this delightful coconut cream and chicken broth based corn chowder. We add a bunch of veggies (usually just whatever we have on hand), chunks of chicken, broth, coconut cream, a few spices and that’s it! You can start by sauteing the onions and garlic and then throw in the rest of the veggies followed by broth and cream, or just add it all together in a large pot and allow to simmer together. Perfect for a snow day to come in and warm up to. Simply add all your ingredients to a pot and bring to a boil. Let simmer for about 30 minutes or until all veggies/meat is cooked. Serve topped with grated cheddar cheese.